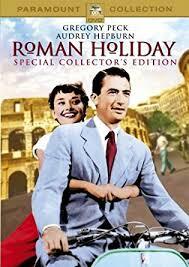 Review: A bored, sheltered princess falls in love with an American newsman in Rome. Audrey Hepburn gives such a fantastic performance. This was originally a role intended for Jean Simmons but I can’t imagine anyone else but Audrey Hepburn playing the part. Gregory Peck’s role was originally written for Cary Grant. Cary Grant was offered the role but turned it down. The script was written by the uncredited, blacklisted Dalton Trumbo. This is a fact not revealed for almost 40 years after the film was made. Well directed by William Wyler. The whole film is written and directed with style and grace. The reason for this to be filmed in black and while is so that the characters wouldn’t be upstaged by the romantic setting of Rome. In Germany this film is titled “Ein Herz und eine Krone”, this translates to “A Heart and A Crown”. This is a film to treasure. Even to this day you can sit down to this film and still enjoy it. It still stands the test of time. According to the BBFC website it states that this film was originally classified U for cinema release in 1953 and was subsequently classified U for video release in 1991. This cinema re-release is rated U and contains a very mild fight scene. Also on the BBFC website it states that there were cuts made to this film when it was released but the details are no longer available. At the Academy Awards in 1954 this won 3 Oscars. They were for Best Actress in a Leading Role (Audrey Hepburn), Best Writing, Motion Picture Story and also for Best Costume Design, Black-and-White. At the Golden Globe Awards in 1954 this won for Best Actress – Drama (Audrey Hepburn). At the Bafta Awards in 1954 this won Best British Actress (Audrey Hepburn).